They say that, the devil is in the detail – if this is so then this new bronze diver from Obris Morgan is positively evil! Stylish and playful, the CuSn8 constructed, Nautilus is OB’s first project for 2018. It offers a sensibly sized 41mm by 11.2mm thick bronze case with 200m of water-resistance. Its uniquely styled bezel looked to nature for its inspiration with a polygonal design based on a Nautilus Shell. If we turn our attention towards the watch’s sunburst enamel dial we are greeted with pops of orange from the Nautilus text underling the OB logo and the all-important prominent orange minutes hands. Other special features of the watch include anti-magnetic resistance as indicted by dial text, and a sturdy-looking operating crown also in CuSn8 bronze. Powering the Nautilus is trusty Japanese movement, the Miyota 9015 Cal. Thoughts? 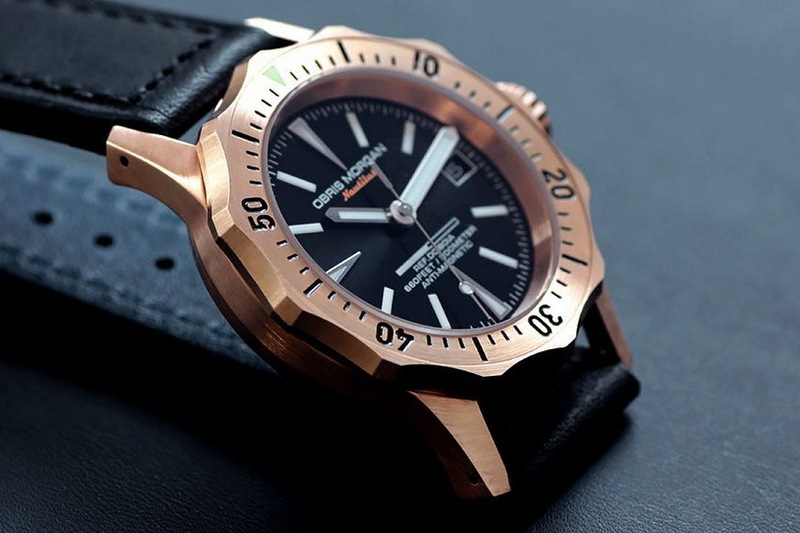 Some nicely merged design influences and styles culminating in a good-looking bronze diver that is neither derivative nor too polarizing in its design. Follow the link HERE or the one embedded below for more on the Nautilus. Follow OB on FB HERE.